FBI Releases Image of Man Wanted For 911 Threats (SHARE WIDELY) — 1389 Blog - Counterjihad! This is believed to be one of the men counter terrorism chiefs say are plotting a terrorist attack in America on the 10th anniversary of the 9/11. 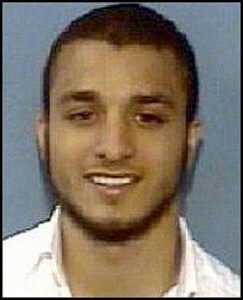 An image of American-born 22-year-old Jude Kenan Mohammad has been posted on the FBI’s Ten Most Wanted list. He has been linked to what officials have called a credible but unconfirmed al-Qaeda threat to set off a car bomb on bridges or tunnels in New York City or Washington. Mohammad is among three al-Qaeda leaders that investigators believe pose a particular threat because they have lived in the U.S.
Should that mission prove impossible, the attackers have been told to simply cause as much destruction as they can. Mohammad, who was born in Florida, dropped out of North Carolina’s Fuquay-Varina High School in 2006 and left the U.S. two years later to visit Pakistan, his father’s homeland. A federal grand jury in North Carolina indicted him and seven other men in 2009 on charges that they conspired to carry out terrorist activities around the world. Two of the men have pleaded guilty, and the trial of four others is set for September 19 in New Bern. Federal authorities have never arrested Mohammad in the case, saying that they believe he has been in Pakistan since the indictment was issued. Click here to view FBI WANTED poster. MUCH more information at The Jawa Report.